Enter the number of pages (originals) in the document. Please note that this is NOT the number of sheets of paper. This is the number of sides, regardless of whether they are printed 1-sided or 2-sided. In a PDF or Word file, it is the page count shown in the top or bottom menu bars. Please do not enter the order quantity here; it should be entered above. * Finished Size: --- Please Select --- 8.5 in. x 11 in. Please enter the total number of color pages in the document. If all pages print in color, then reenter the page count or total pages here. If there are no color pages, leave default text "None" as shown. You must come to our shop in Palo Alto in order to review or pick up a hard copy proof (aka "first article" or "sample") of your project. We'll contact you to verify schedule. Proof review may add to the turnaround time so please plan accordingly. 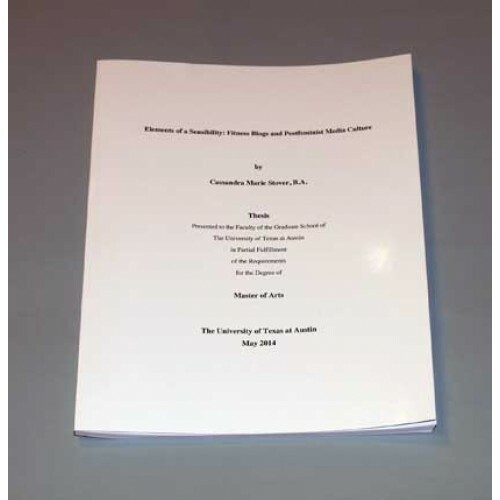 We print and bind theses and dissertations for students attending Stanford, Sofia and San Jose State Universities as well as visiting students from colleges in Europe. Choose from a variety of appropriate paper stocks and bindings. We do velo (strip) and coil bound books as well. 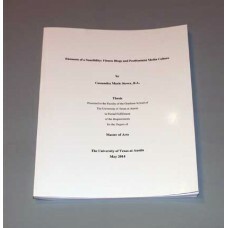 Just click Dissertations & Thesis on the sidebar to the right. Please see our file preparation guidelines for tips about setting up your files by clicking the link below. Please contact us if you have any questions or for custom quotes.